Few things have inspired the human imagination quite like the ocean. The vast, mysterious deep is the stuff of poets, artists, explorers, and scientists. A natural result of this seemingly endless, unfathomable world-beneath-the-waves is the emergence of a broad and persistent ocean mythology, ranging from tales of sea monsters, to near magical healing powers, to perceptions of infinite abundance. Every year, we take a week to explore these myths – the fictions, falsehoods, and pseudoscience – surrounding the ocean. We’ve got some great posts on our plate, starting today. We’ll be counting down our top seven misunderstood marine creatures, exposing some deceptions from the climate denial industry, investigating rumors surrounding the use of ethanol additive in outboard motors, and having some fun with cryptozoology. David will probably have something to say about sharks, too. Along the way, our friends from Deep Fried Sea will join us as they wander the ocean looking for the still missing Iffy and meet all kinds of weird and wonderful marine creatures. 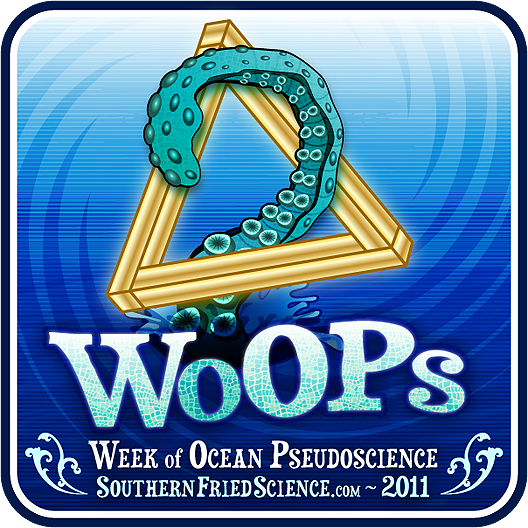 That awesome logo was designed by Jason Robertshaw of the Cephalopodcast. If any other ocean bloggers want to join in, feel free to stamp your post with that logo and shoot me an e-mail so we can link to it from the homepage. Over on twitter, feel free to tweet us your favorite ocean psuedoscience, with the hashtag #PseudOcean (and follow us @SFriedScientist, @WhySharksMatter, and @bgrassbluecrab). So settle in for a week of ocean pseudoscience.